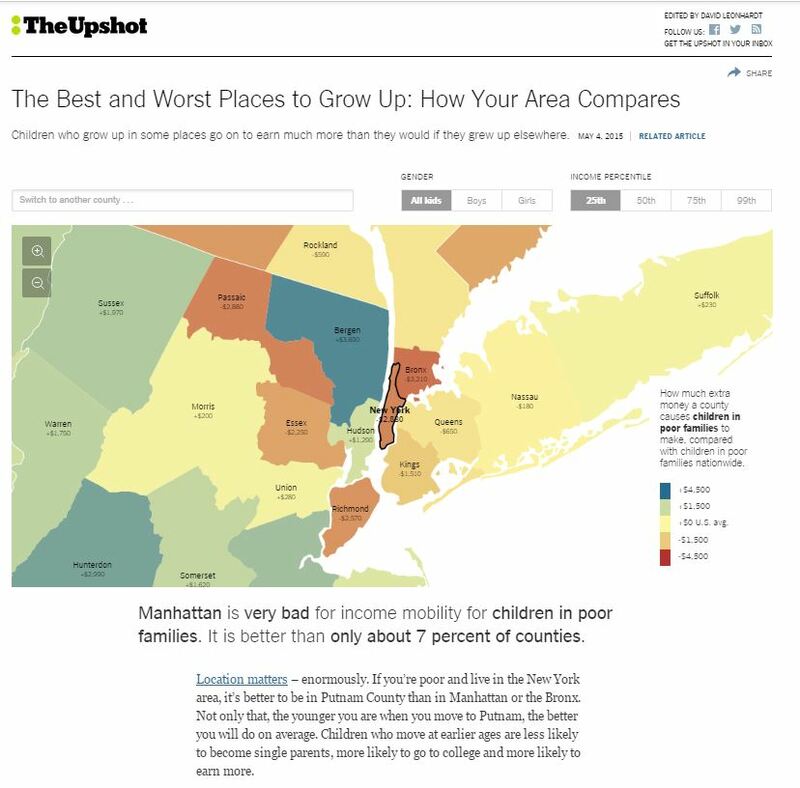 Nieman Labs had an interesting piece yesterday about this NYT Upshot story on the best and worst places to grow up in America. It’s not that the story itself was great – although it wasn’t bad, and in any case was technically a companion piece to this much more traditional NYT story – but that different Upshot readers got different versions of the piece, depending on where they were. …what’s different is that the article itself is almost self-aware: It knows what county you’re in and alters the story text depending on your location. So while it’s not quite the kind of extreme personalization that news online is theoretically capable of, it’s yet another important step in that direction. And not so much just because these kinds of stories can make data more compelling and useful to readers, but more because it edges us further down the road of rethinking what a news story is, and how we’re providing what our readers need. As Nieman’s Justin Ellis notes, when a story is about location, it makes sense to get the reader’s location in the piece as high up as possible; and in this case that was only possible because there was a ton of data underpinning the story, some notion of where the reader was, and a simple mechanism for generating machine-written prose. The Upshot team decided to use prose templates that could be rewritten by a bot based on the data specific to where you live and your neighboring counties. The end result: A piece that’s much more more relevant, useful and engaging to users. And, for that matter, why confine ourselves giving readers information when we want to write stories? Why not let readers decide when they want the information? Or even give them different ways of approaching the same information, from sports stories for non-sports fans to systems that generate different stories depending on how you tweak the data going into them? In other words, if we’re going to be in the public-interest information business, we should be much more open to how users might want that information, beyond our standard notions of creating packages of words, pictures, videos, and graphics and sending it down a pipe to as many people as possible. To be sure, this kind of personalized, information-on-demand isn’t meant to substitute for the kind of deep digging and accountability journalism that society needs; on the other hand, that kind of great watchdog journalism isn’t the only kind we need, either. We need both, and there’s no reason why one can’t help feed the other, and vice versa. None of this will be easy to implement, and there are certainly lots of unanswered – even unasked – questions about how a more personalized, news-on-demand type of journalism would operate. We can’t edit every version of every story; we can’t vouch for all the data being accurate; we don’t have ways to handle corrections for multiple versions of stories that may live fleetingly for individual readers. All of which would drive traditional newsrooms into fits. But all this is worth exploring, and this piece from the Times is a very good step in that direction. I’m trying to imagine Hemingway using that technique in an online version of “A Farewell to Arms,” but it isn’t working for me. It’s true – and it doesn’t work well as a dataviz or animated GIF, either, much as I tried. . I guess there’s a time and place for every technique.